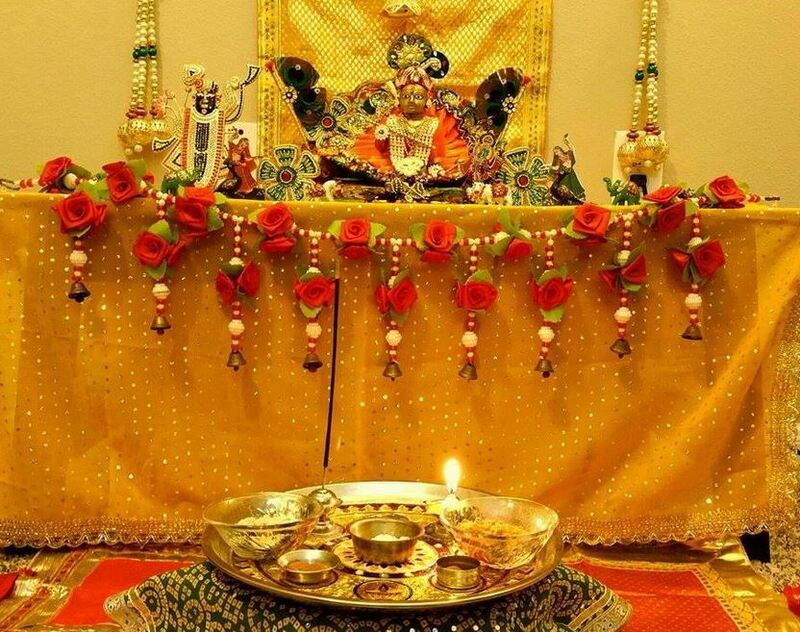 Discover some of the best decoration ideas for Krishna Janmashtami. 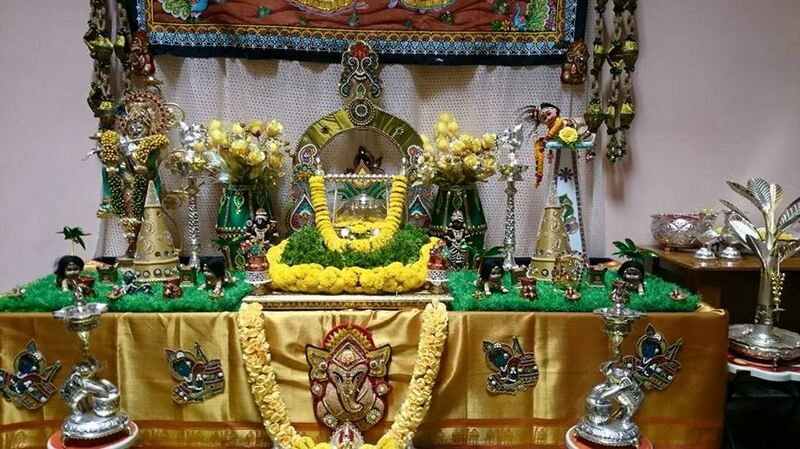 Use these ideas to decorate lord Krishna’s idol and jhula and your home during Janmashtami. Janmashtami is a popular Hindu festival. It marks the birth anniversary of Lord Krishna. Lord Krishna is the incarnation of lord Vishnu and a symbol of truth and righteousness. Also known as Muralidhar, he is welcomed on earth with great zeal and gaiety amidst lots of color, fragrances and glitters. 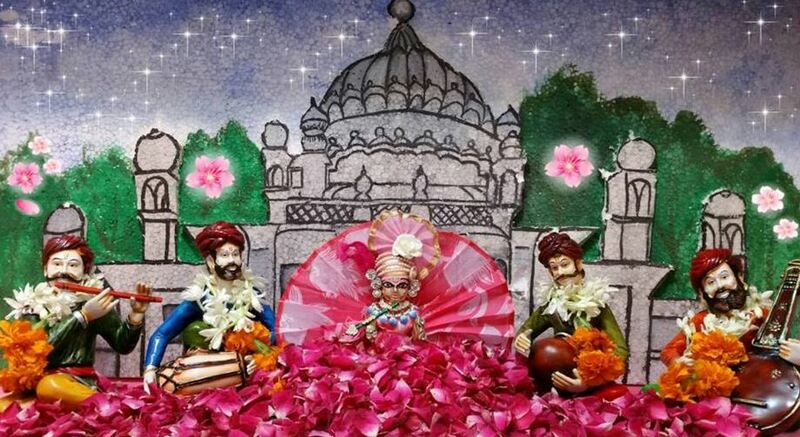 Here are some incredible decoration ideas for Krishna Janmashtami, do check them out. 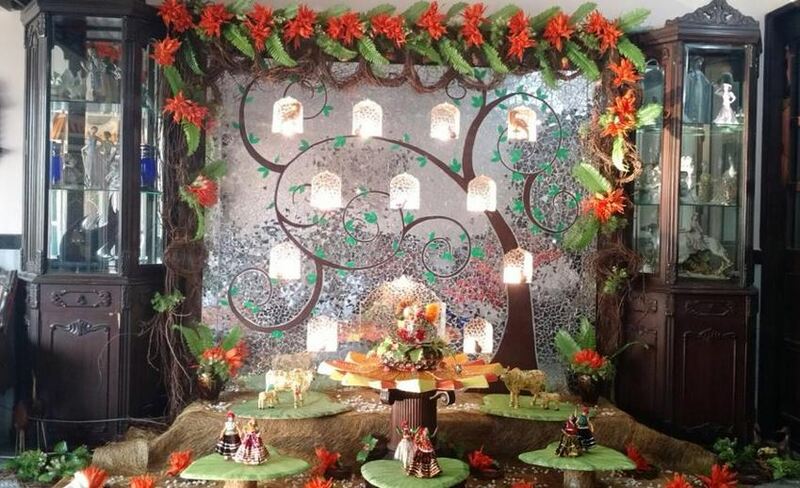 These decoration ideas for Krishna Janmashtami are enough to tingle the festive vein in the atmosphere. 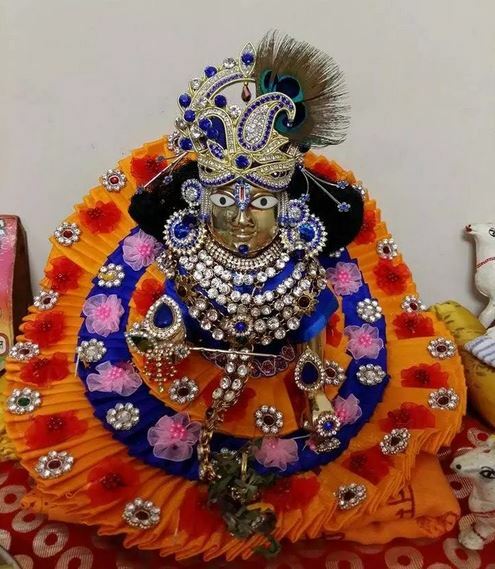 Place a picture of Laddu Gopal on the shelf. Decorate the background with marigold flowers and lace it with balloons. The heavily carpeted floor adds color to the decoration. 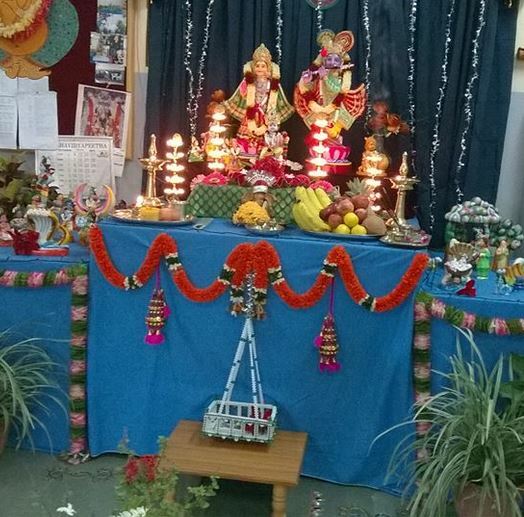 Cover the table with a nice table-cloth and place the deity on the table. Put a Krishna jhula on a small stool. Do the decoration with artificial flower, garlands and streamers. The electric lamps placed near the deity, when lit, create magic. 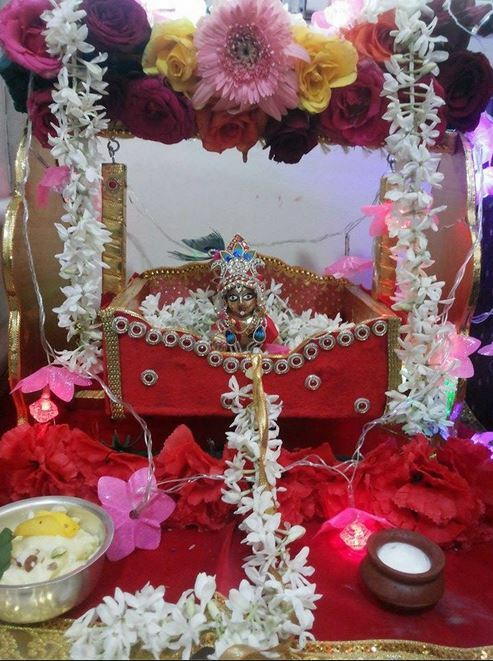 Here are some simple decoration ideas for Krishna Janmashtami. 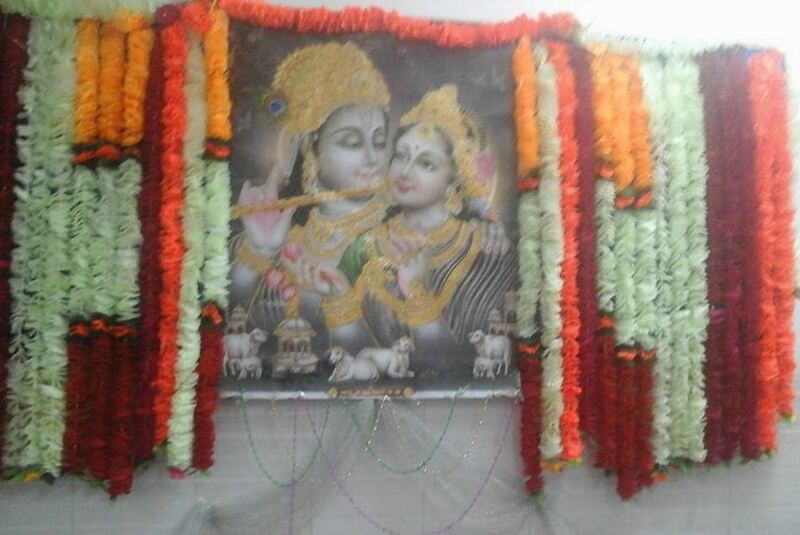 Decorate a beautiful picture of Krishna-Radha on the wall and decorate it with flowers. Place the jhula on a table below and decorate it with colorful flower garland, petals and the glittering streamers. 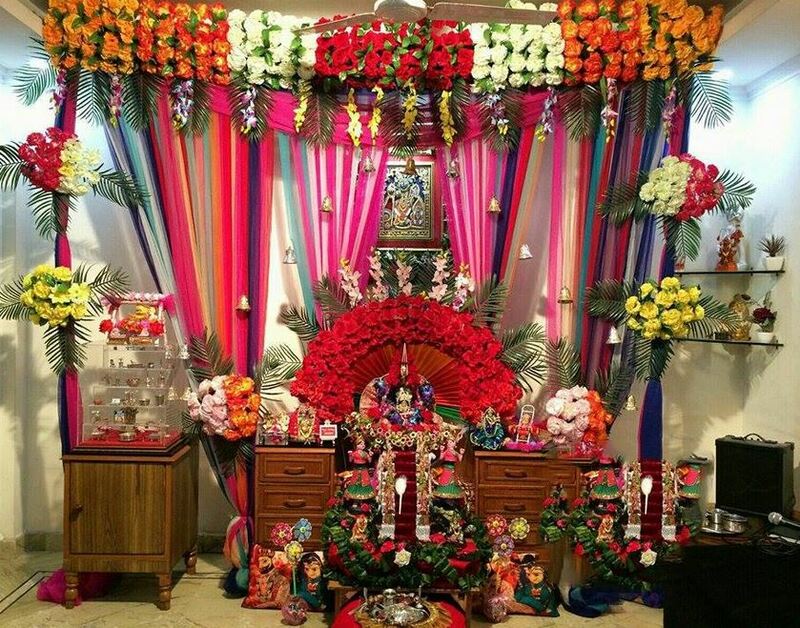 Have a look at these incredible decoration ideas for Krishna Janmashtami. You can highlight small episodes from Lord Krishna’s life. Gokul, portray the birth place of Krishna in the creation. There is also this beautiful dahi handi, painted vibrantly and decorated with mirrors and bells. You can put cotton to show dahi and hang it from the ceiling. 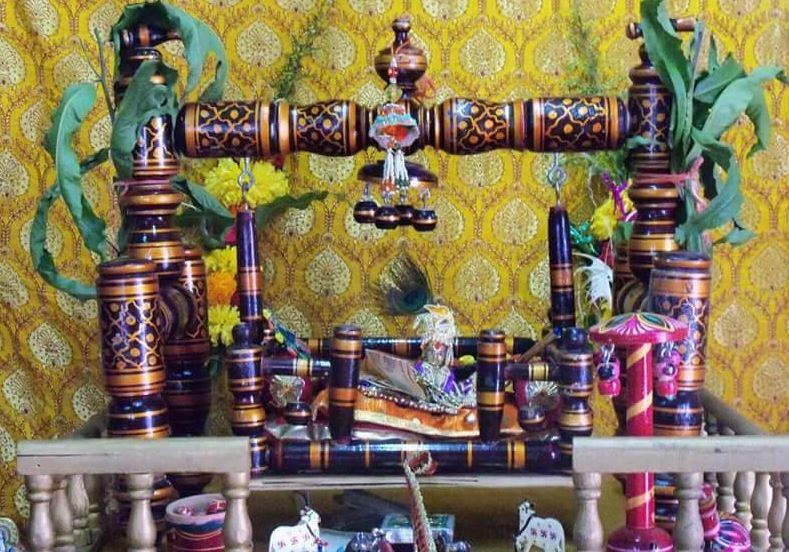 This decorative pooja area is beautifully decorated with torans. Place the deity on a pedestal and cover it with a lovely zardozi cover. The aarti thali in brass is adding on to the sparkling aura. 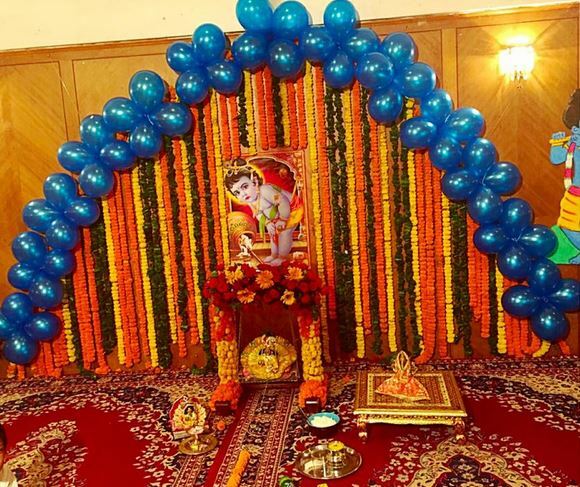 Check out these dazzling and exciting decoration ideas for Krishna Janmashtami. This decoration has a plethora of vibrant colors. Do the backdrop with colorful fabric and adorn the mandap with beautiful flowers. Convert one corner of your living room into this lovely creation. 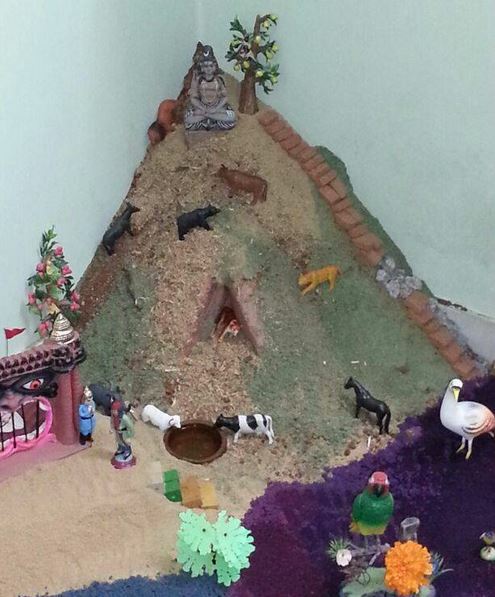 This decoration has a glimpse of Indian village and the feel of happiness and festivity pervading in the society. 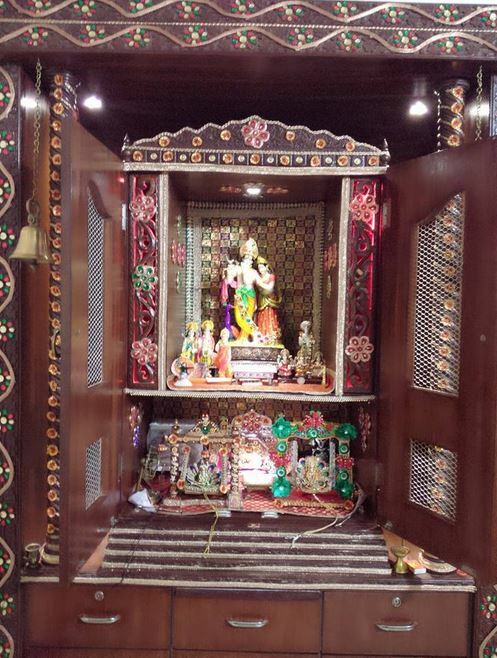 The deity has been placed in the mandap decorated with beautiful flowers. The small toys mark the atmosphere of devotion and contentment among the people. 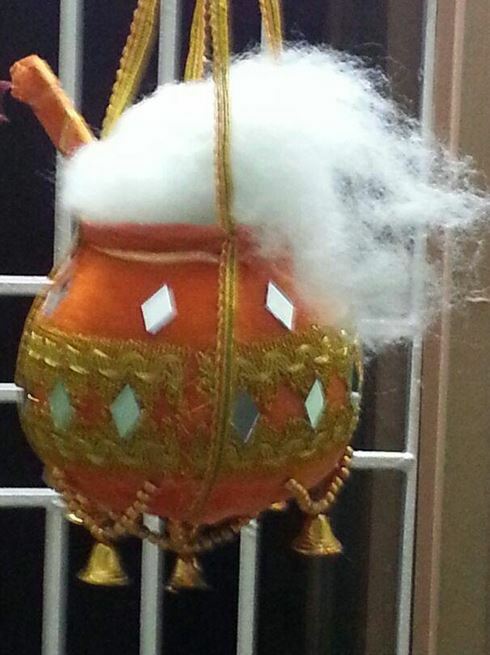 This Janmashtami decoration is done inside the pooja cupboard. The mandap is decorated using artificial decorative flowers. Small lights have been fixed to highlight the decoration. 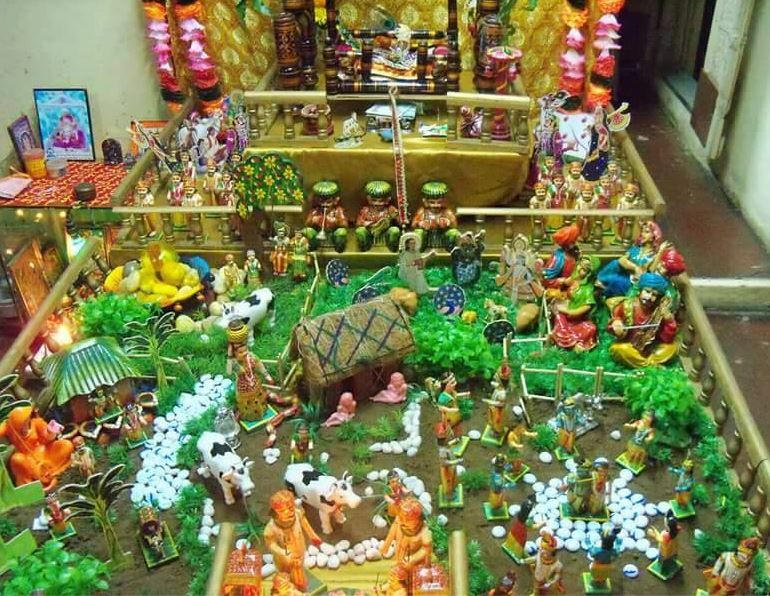 These are amazing decoration ideas for Janmashtami. Do the decoration with flower petals. 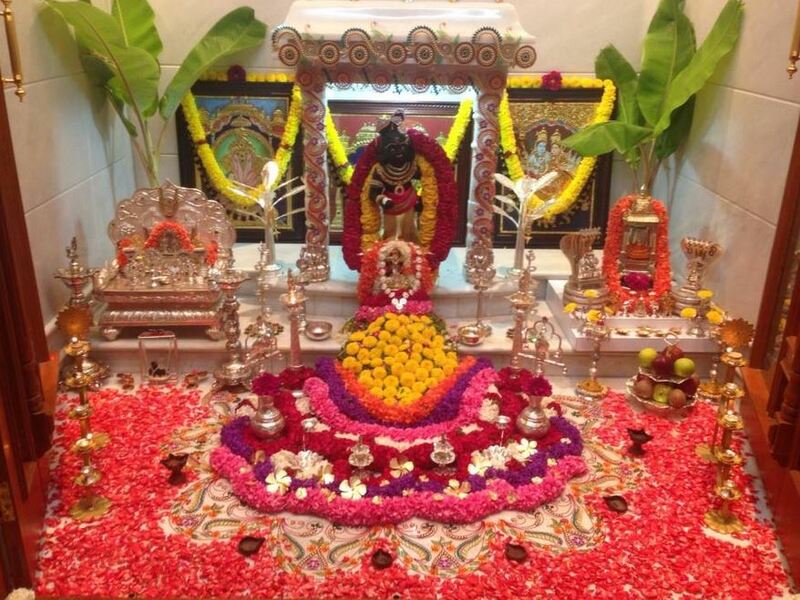 Artificial flora creates the feel of a garden where the deity has been kept. The silverware adds up to its grandeur. 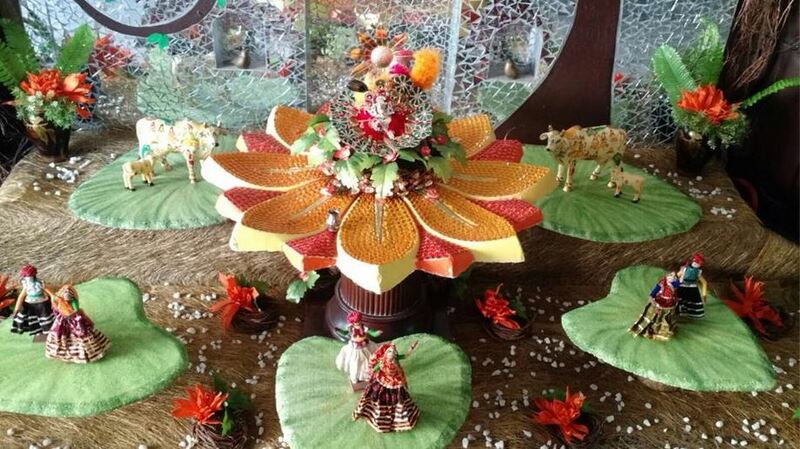 You can place the jhula on an artistically decorated table. The backdrop in this decoration is a pretty stained glass in the living area. Decorate the edges with artificial flowers giving a colorful look to the setup. One more attractive feature is the large cut outs of lotus and leaves from thermocol sheets. 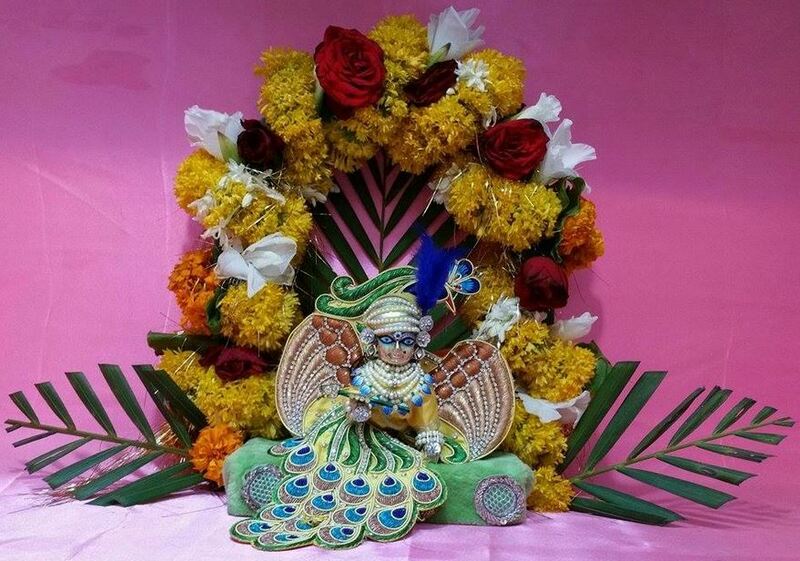 Such are unbelievably innovative decoration ideas for Krishna Janmashtami. 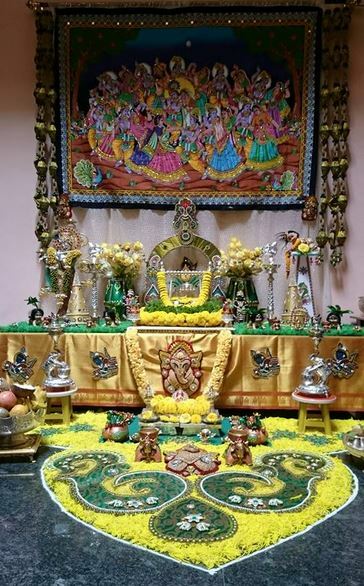 Do this awesome decoration in your pooja room. Decorate the entire room with flowers and flower petals. You can put the traditional brass lamps along with the silverware. The banana stem is also used for decoration as it holds a pivotal place in Hindu religion. The most attractive feature is the deity flanked by the peacocks on either side. 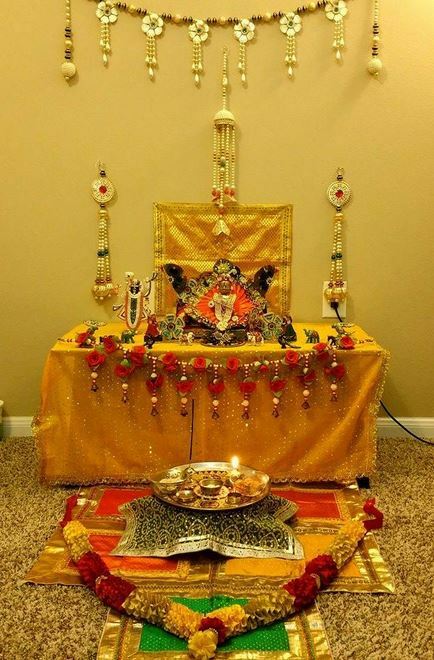 Place the bhog on steps in front of the deity. The backdrop is beautiful in shimmering fabric laced with beautiful flowers. This is a beautiful decoration in which the artificial children swimming pool is used. Place Lord Krishna inside the pool and fill it with balloons. Decorate the rim of the pool with nice artificial flowers. Even the umbrella is looking beautiful in various vibrant colors. The deity or Lord Krishna receives a grand welcome on this occasion. 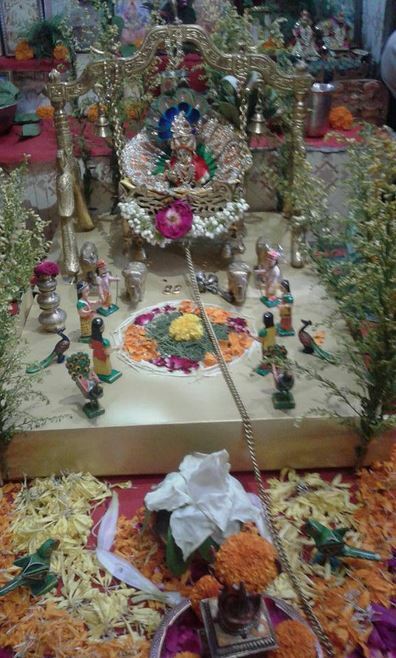 The idol is decorated using various creative ideas. 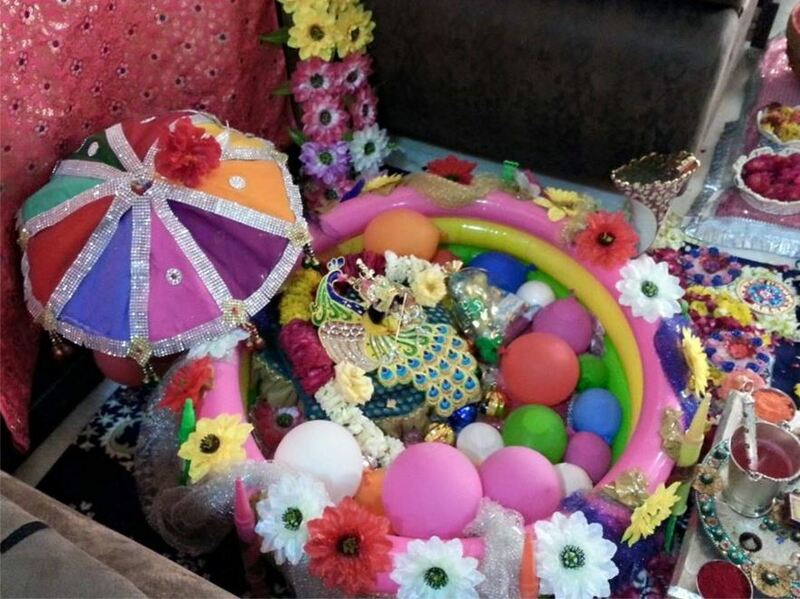 You can decorate the idol with costly fabrics like silk, beautiful motifs, colorful stones, flowers, leaves, streamers etc. 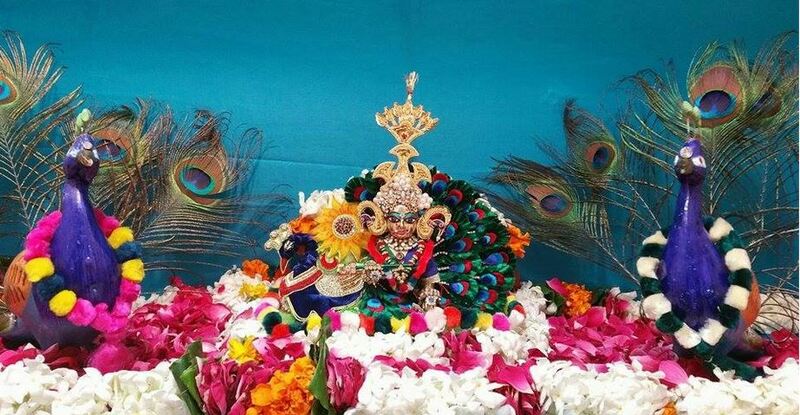 So check out these mesmerizing ideas on how to decorate Lord Krishna on Janmashtami. 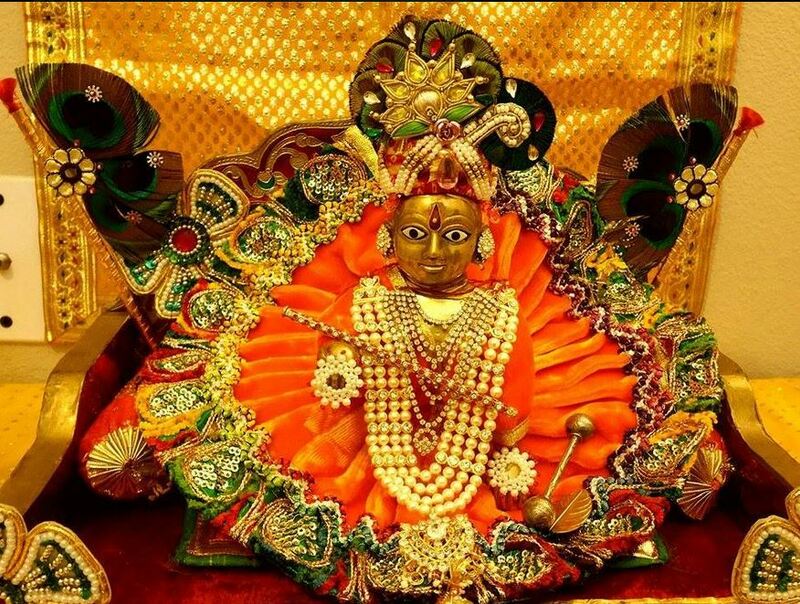 The idol of Lord Krishna is decorated in yellow satin attire with lovely zardozi lace. Yellow color in Hindu culture stands for happiness, peace, meditation and knowledge. In Hindu mythology Lord Krishna is clad in yellow symbolizing his representation of knowledge. 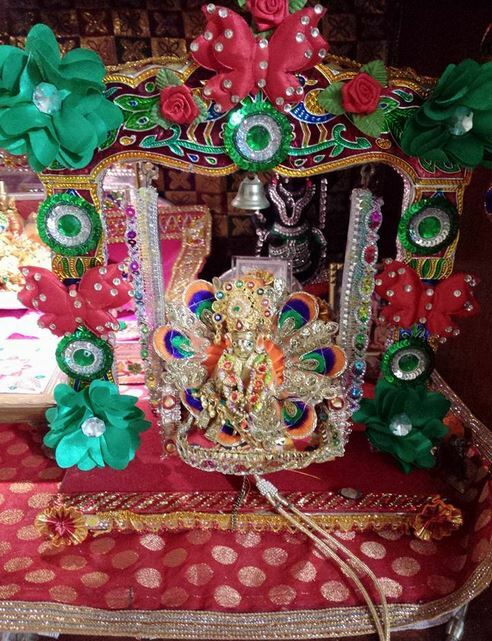 Check out the colorful attire of the deity! The lovely saffron and blue dress is made using satin fabric with beautiful handmade flowers stitched to it. The dazzling stone jewelry adds on to make it all the more attractive. 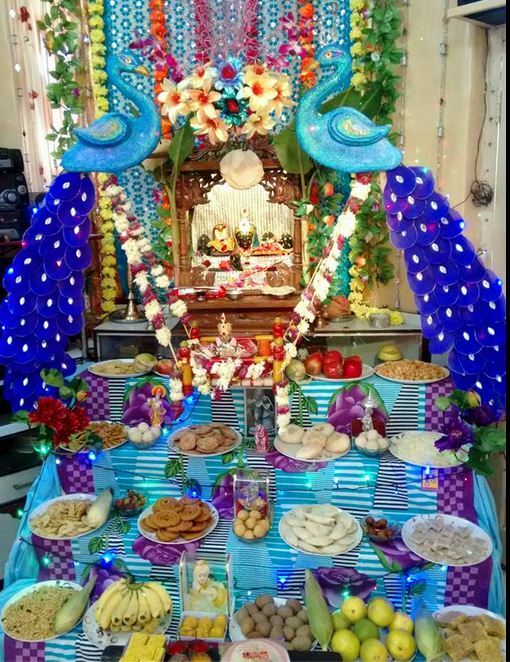 A simple and attractive idea to decorate the idol! 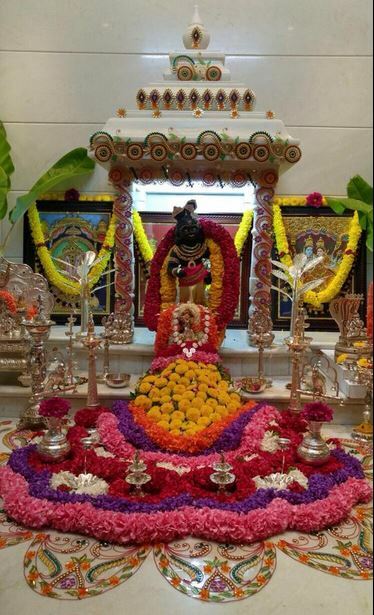 You can make the backdrop using leaves and flowers and place the deity in the center. The idol looks beautiful against the backdrop of the Taj Mahal. You can dress Lord Krishna in pink and put lots of pink petals to give the soft and musical look. According to our mythology Lord Krishna loves music, specially the flute. This is a stunningly attractive idea for idol decoration. 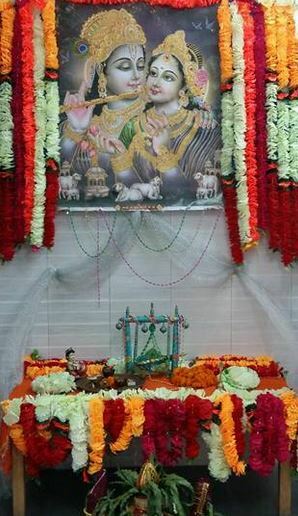 The idol is seen sitting on the peacock and the backdrop comprises mainly of the peacock feathers. The peacock’s feather destroys all negativity like anger, greed or jealousy and fills in the ambience with positivity. Krishna Janmashtami is associated with the earthly appearance of Shri Krishna. Laddu Gopal or the infant Shri Krishna is placed in the jhula and the occasion is celebrated with immense happiness, enthusiasm and devotion. 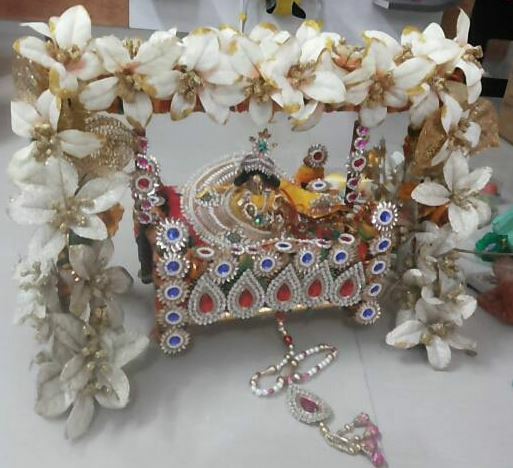 Here are some innovative and beautiful Krishna jhula decoration ideas. This spectacular Krishna jhula is decorated with beautiful and fresh flowers; the jhula is covered red using velvet fabric. Series bulb that too in the shape of a flower is fixed to accentuate the beauty! Here is this wooden jhula from Gujarat which is quite decorative in itself. You can decorate it with flowers, leaves and toran. Lord Krishna is placed inside the jhula on a silk cushion. This is a marvelous Krishna jhula decoration. The silver jhula has been placed amidst flower pots to give a feel of nature. You can do lots of landscaping around the jhula thus creating Lord Krishna’s beautiful and pious abode. Utilize your creative instincts to decorate the pooja space with flower rangoli. 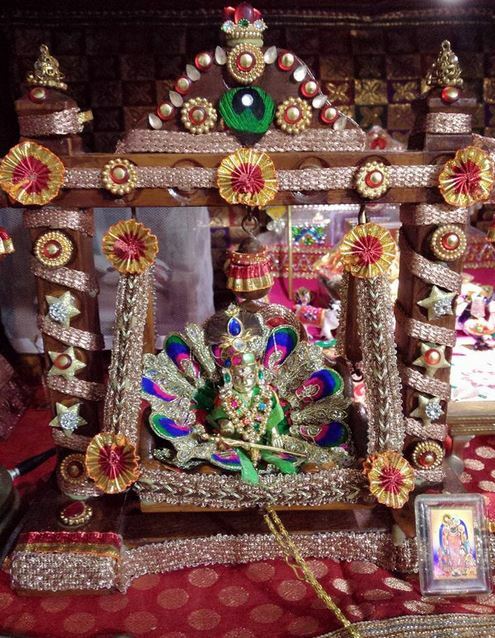 This wooden jhula has colorful motifs on it. You can decorate it with red and green flowers and butterflies made of cloth and add lots of gold and silver laces. You can use zari strips to decorate this jhula. Beautiful decorative motifs and rhinestones are stuck to enhance the beauty. Look at this beautiful decoration. Adorn the wooden stand with beautiful white flowers. The motifs used are of pearls and stones. This decoration has an aura of simplicity and devotion. This is a stunningly lavish decor. Place the jhula on a carpet. 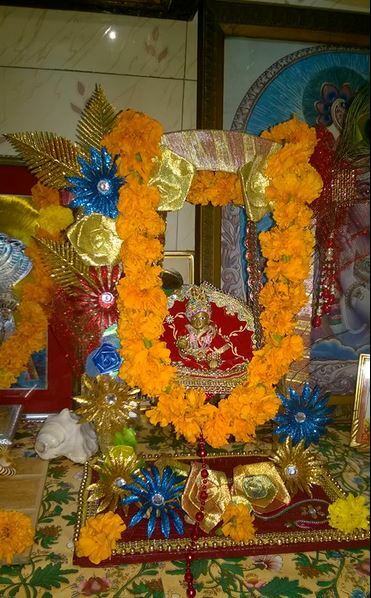 Put a marigold garland on the frame of the jhula that is draped in satin ribbon. You can use shimmery artificial ferns and flowers to add on to this mesmerizing beauty. 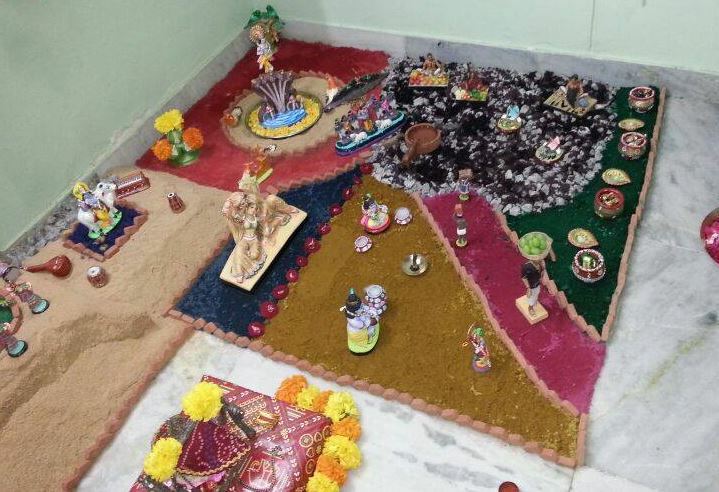 This entry was posted in DIY Crafts, Pooja Room, Pooja Room Designs and tagged Best Janmashtami Rangoli Designs, Decoration for Krishna Janmashtami, Decoration Ideas for Krishna Janmashtami, How to Decorate Lord Krishna on Janmashtami, How to Decorate on Janmashtami, Janmashtami Decor, Janmashtami Decoration, Janmashtami Decoration for Home, Janmashtami Decoration Ideas, Janmashtami Decoration Ideas at Home, Janmashtami Decoration Images, Janmashtami Decoration Photos, Janmashtami Jhula Decoration Ideas, Janmashtami Pooja Decoration, krishna Janmashtami Decoration Ideas, Krishna Jhula Decoration for Janmashtami, Krishna Jhula Decoration Ideas, Sri Krishna Janmashtami Decoration Ideas by Preeti Sinha. Bookmark the permalink.